This elegant and comfortable apartment is located in Via Santo Spirito, an ancient Florentine street with Medieval buildings (Frescobaldi, Medici, Lanfredini, Manetti, Caponi Family). Very close to the famous Ponte S. Trinita that leads to Via Tornabuoni and close to the famous antiquarian’s street, Via Maggio. It is about 5 minutes walk from Ponte Vecchio and Piazza della Signoria, 7 minutes walk from the Duomo. It has been recently beautifully restored, furnished and decorated. It is on the fourth floor (without elevator) of an old building in the historical centre and consists of: living room with pull out sofa bed plus an extra foldable bed (3 people), kitchen, upstairs bedroom with double bed and skylight, 2 bathrooms with shower, one on each level. Bright, quiet, high standard of furniture (mostly antiques), typical florentine cotto floors and wooden beamed ceiling. Upon your arrival you will be welcomed by the hostess. 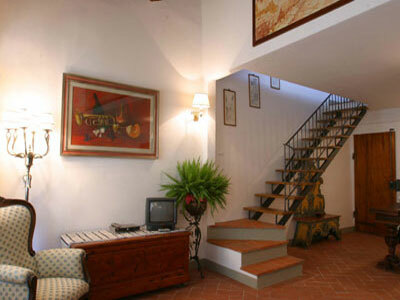 You will also find a complimentary bottle of Chianti wine and assorted fresh fruit. Very close to the famous Ponte S. Trinita that leads to Via Tornabuoni and close to the famous antiquarian’s street, Via Maggio. It is about 5 minutes walk from Ponte Vecchio and Piazza della Signoria, 7 minutes walk from the Duomo.